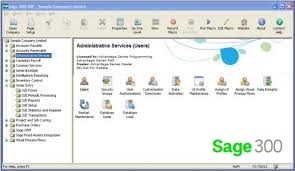 Sage 300 - Information Innovators, Inc.
Sage 300 is a business management software solution designed for small and medium-sized businesses. Critical program functionality includes support for accounting, sales, service, purchasing, and inventory management tasks. Sage 300 is available in two product versions—the legacy Sage 300 product and Sage 300c. 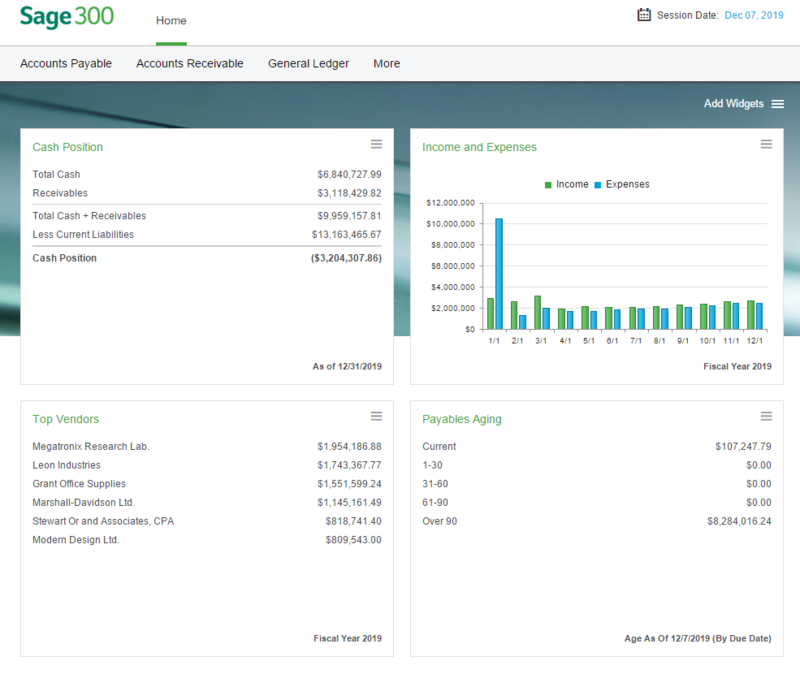 Sage 300c is a subscription-based version of the software that provides web screen capabilities to allow users to access core product functionality via a web-browser. 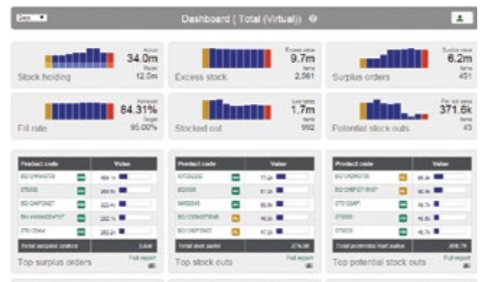 Sage Inventory Advisor helps your Sage ERP work smarter by utilizing the data already in your system to reduce stock-outs, excess inventory, and working capital. Together, they can analyze inventory data to identify where the biggest improvements can be made, produce quality forecasts, and suggest optimal replenishment recommendations—all at an affordable price. Bottom line, Sage Inventory Advisor takes very little time to deploy. In addition, because Sage Inventory Advisor is in the cloud1 , you never have to access a local server or update your software to run the latest version, and thanks to PGP data encryption/decryption, you can feel more secure about your data—plus, best of all, you have access to your data anytime, anywhere. And with budget friendly, monthly subscription pricing, Sage Inventory Advisor is a win-win for your business. 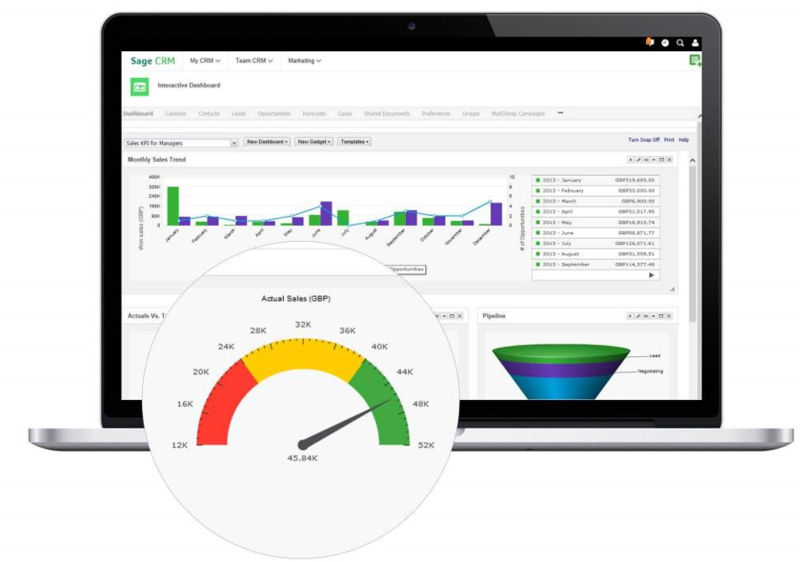 Sage Inventory Advisor is designed to integrate with your Sage ERP solution; it’s built from the ground up to specifically help you extract added value from the numbers already being generated across your organization. 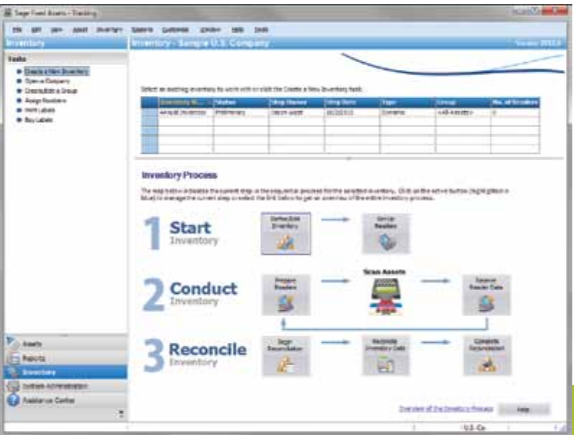 Sage Inventory Advisor automatically connects to inventory data in Sage 100 ERP, Sage 300 ERP, Sage 500 ERP, and Sage ERP X3 systems for analysis, forecasting, and replenishment, as well as order and supplier management. No need to manually import or export data. And it complements Sage Inventory Management and Inventory Control modules to provide dynamic forecasting and planning capabilities. 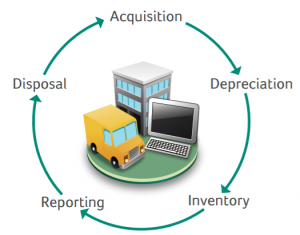 View the Sage Fixed Assets ROI Calculator Benefit from tax savings with an all-in-one solution. 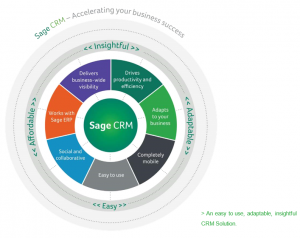 Sage CRM is an affordable, adaptable and easy to use CRM solution designed with the needs of small and medium sized companies at its core. Using Sage CRM our customers save time, increase productivity and gain greater visibility across the business for actionable decision making. Sage 300c supports the entire lifeblood of a business: its financials, inventory, projects, payments, sales order and customer management, and more. Mobility allows for anytime, anywhere access to transactions and a real-time, accurate picture of the health of your business. Now your business can compete with laser-focused accuracy and agility. Effortlessly consolidate, analyze, and report on multiple business units, subsidiaries, companies, and countries within your business. Manage financials, close books, and easily report results by company for multiple companies or in a consolidated company view. Process intercompany transactions and roll up numbers across all your entities, domestic, and abroad. 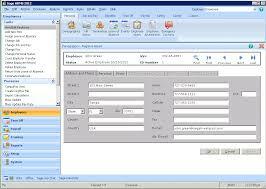 Transfer and merge account and transaction information between separate company and branch office locations. Enter transactions and automatically distribute across two or more companies. Easily estimate projects, enter and report costs, and track billings, payments, and profits. With customizable categories, it’s flexible enough to manage large or small projects for any business environment. Maintain profitability using comprehensive budgeting and profit analysis tools to determine if projects are on track, costs are in line, and resources are properly allocated throughout the project. Get detailed billing and revenue recognition processes with multiple accounting methods for your specific project accounting requirements. Mix and match the project types and accounting methods for very complex or simple projects. Tighten control over your project cycle—from calculating an accurate bid to delivering products on schedule by easily accessing project detail data through reports and drill-down menus. Sage Intelligence Reporting is available for Sage 300. To purchase Intelligence Reporting, get in touch with our sales team. Make sense of your data so you can make more informed business decisions. Use your existing Microsoft Excel knowledge to easily create and edit reports, giving you instant visibility across your business. Spend more time focusing on analysis and interpretation of your information and less time pulling the data together. 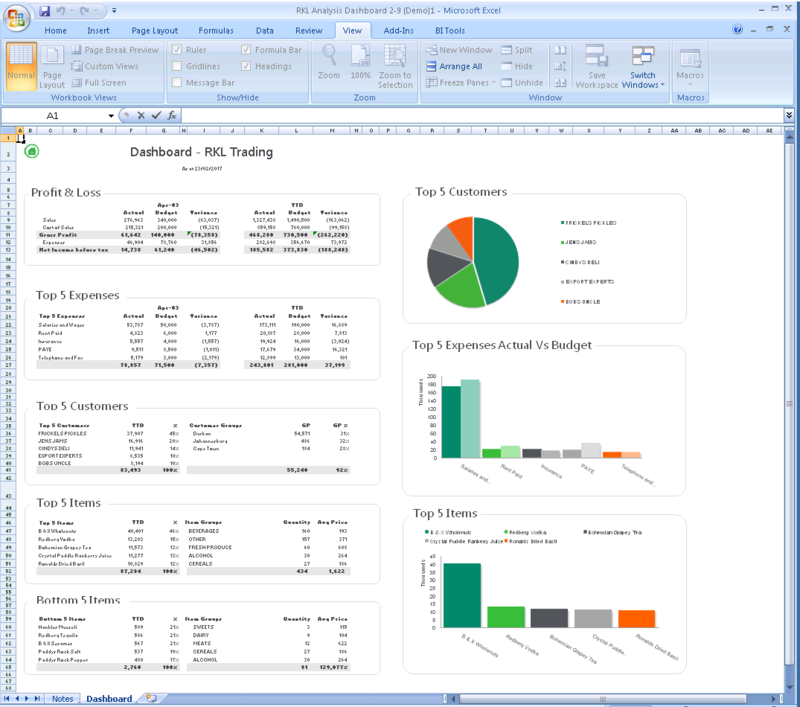 Design customized reports that suit your business’s unique requirements. Already have Intelligence Reporting but need help getting started? Ready-to-use reports are already formatted for you. To run a report all you do is select the information you want to report on. Get a snapshot view of your data with graphs, charts and slicers that make it easy to see what’s going on in your business. Need a specific report? Customize a ready-to-use report or create one from scratch using Excel and Intelligence Reporting tools. Spend more time analyzing and interpreting your information to make smarter decisions and less time putting reports together. Easy scalability from a single retail location to multiple sites and tills. Multi-transactional processing modes: online, passive, offline and summary. User and group security rights. Customizable reports and multilingual interfaces. Add, edit and search items, barcodes and customers. Layaways, sales, split sales, returns and exchange transactions. Barcode and manual promo grouping. Various pricing models: Customer price lists, price levels, volume discounts, contract pricing, Time Shift pricing ... and more. 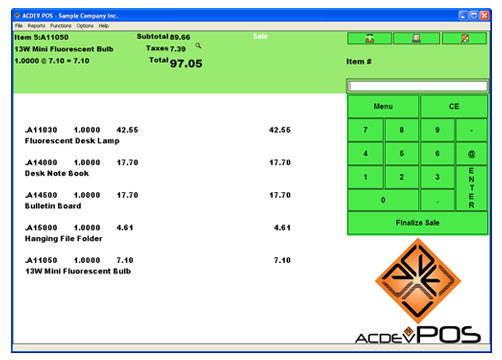 Modify/discount at the line item and/or transaction level. Multi input entry to optimize speed. Basic Loyalty Point and Gift Card. POS hardware integration to touch screen, weigh scales, barcode scanners, MSR, display poles, receipt printers and cash drawers. Seamless integration to Sage ACCPAC ERP. Also included are the ACDEV Kiosk and ACDEV Webstore. Reduce time-consuming and error-prone clerical work by centralizing, tracking, and reporting employee data that may be scattered across multiple systems. Ensure government compliance to avoid company risk in meeting federal and state rules, regulations, and reporting requirements. Manage your employee information more effectively with a set of powerful tools. Closely monitor employee records and personnel actions, HR compliance, benefits administration, absence management, reporting (standard and custom), and data import/export actions. Do you treat your employees like investments? A company is only as good as its workforce. We are used to talking about a company as if the organization itself is a person, but an organization does not generate ideas, does not give service, and by itself is neither efficient nor productive. People make all of those things happen. At Sage, we believe that employees are the most important component in the quest to improve business results. It makes sense to treat employee-related expenses as an investment in the workforce. Like any other investment, this critical company investment must yield a healthy return. We call that the Return On Employee Investment™ or ROEI™. HR-related technology such as Human Resource Management Systems (HRMS) and Talent Management solutions were traditionally thought of as cost reduction tools, saving time and automating routine administration to raise productivity within the HR department itself. An HRMS certainly does deliver that result. But when viewed as part of an investment in a competitive workforce, it can do much more. Through employee self-service, training, development, compensation, and benefits management, HRMS and Talent Management can provide the tools to help keep employees engaged and satisfied. These systems also deliver the analytics to help managers and executives examine trends, support business decisions, and plan for future organizational changes. Investing in an HRMS solution, integrated with performance management, learning and training, tools for decision support, self-service portals, and more, is an investment in the most important asset of the organization: its employees. And the return on the investment in employees can turn a struggling company into a winner. An industry-leading, customizable HRMS solution, Sage HRMS helps companies optimize their HR business processes as well as maximize their Return On Employee Investment (ROEI)™. Developed by HR professionals for HR professionals, Sage HRMS delivers a tightly integrated set of comprehensive features and functionality that increase efficiency and improve productivity at every level in the organization. With Sage HRMS, you can successfully meet and respond to the HR management challenges you face every day in the areas of payroll, benefits, employee self-service, attendance, recruiting, training, workforce analytics, and more. By automating and streamlining your day-to-day HR business processes using Sage HRMS, you and your staff are freed up to spend more time and energy on the business asset that is most vital to your company—your employees. The Sage HRMS centralized database contains all the present and historic information about active and nonactive employees of the organization. Sage HRMS is your single source for flawless payroll processing, employee administration, registration, analysis, employee life-cycle management, and all other crucial employee-related information. The benefit? High accuracy and reliability of your data translates into high efficiency for your organization. Unlike other systems, Sage HRMS is the only solution that combines low cost, ease of use, and the ability to dynamically share information with executives, managers, and others both inside and outside your organization, so leaders receive accurate information securely, when and where they want it. From on-demand information sharing to process automation and real-time business alerts, Sage HRMS is designed to support executive analysis and decision-making. Sage HRMS helps ensure that the HR mission-critical needs of your organization are met with the employees and programs you require today—and even as those needs change and grow well into the future. © Copyright 2016 Information Innovators. All Rights Reserved. This website is owned by Information Innovators. Information Innovators is independent from Sage and is not authorized to make any statement, representation or warranties or grant any license or permission on behalf of Sage regarding any product, service or website content. Certain materials made available on or through this website are owned by Sage and cannot be used without the prior written permission of Sage.